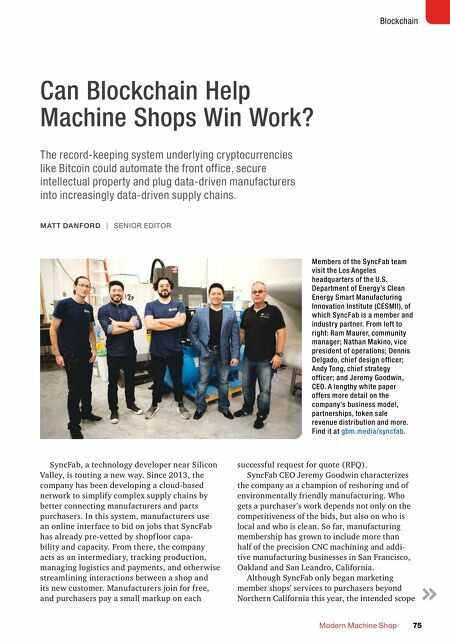 Modern Machine Shop 75 Blockchain Can Blockchain Help Machine Shops Win Work? The record-keeping system underlying cryptocurrencies like Bitcoin could automate the front office, secure intellectual property and plug data-driven manufacturers into increasingly data-driven supply chains. SyncFab, a technology developer near Silicon Valley, is touting a new way. Since 2013, the company has been developing a cloud-based network to simplify complex supply chains by better connecting manufacturers and parts purchasers. 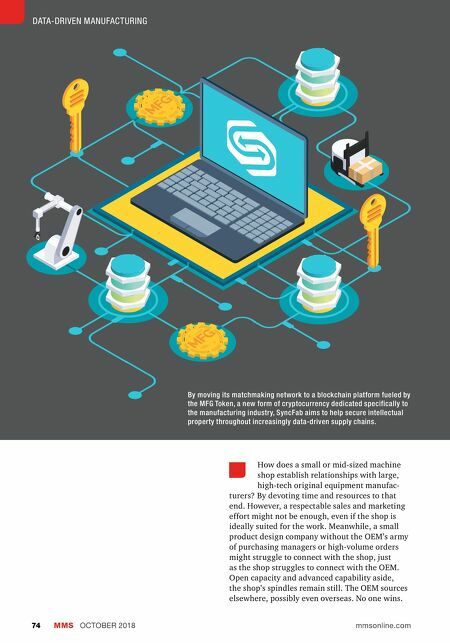 In this system, manufacturers use an online interface to bid on jobs that SyncFab has already pre-vetted by shopf loor capa- bility and capacity. From there, the company acts as an intermediary, tracking production, managing logistics and payments, and otherwise streamlining interactions between a shop and its new customer. Manufacturers join for free, and purchasers pay a small markup on each successful request for quote (RFQ). SyncFab CEO Jeremy Goodwin characterizes the company as a champion of reshoring and of environmentally friendly manufacturing. Who gets a purchaser's work depends not only on the competitiveness of the bids, but also on who is local and who is clean. So far, manufacturing membership has grown to include more than half of the precision CNC machining and addi- tive manufacturing businesses in San Francisco, Oakland and San Leandro, California. Although SyncFab only began marketing member shops' services to purchasers beyond Northern California this year, the intended scope MATT DANFORD | SENIOR EDITOR Members of the SyncFab team visit the Los Angeles headquarters of the U.S. Department of Energy's Clean Energy Smart Manufacturing Innovation Institute (CESMII), of which SyncFab is a member and industry partner. From left to right: Ram Maurer, community manager; Nathan Makino, vice president of operations; Dennis Delgado, chief design officer; Andy Tong, chief strategy officer; and Jeremy Goodwin, CEO. A lengthy white paper offers more detail on the company's business model, partnerships, token sale revenue distribution and more. Find it at gbm.media/syncfab.